Amprolium HCl is an anti-protozoal drug and in chemical structure analogue to thiamine (vitamin B1). It inhibits the use of thiamine by the protozoal parasites. 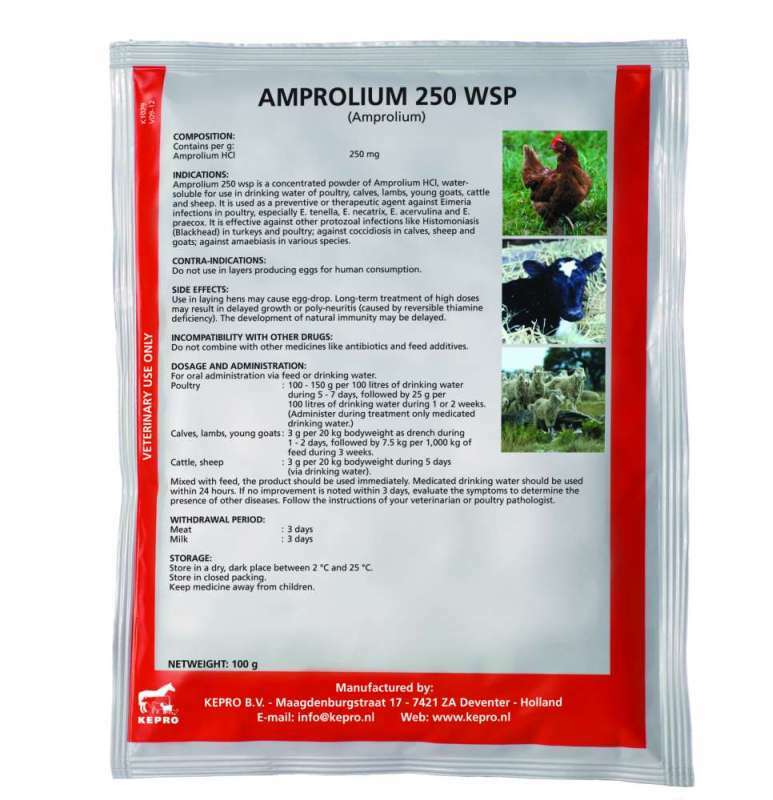 Amprolium 250 wsp is a concentrated powder of Amprolium HCl, water-soluble for use in drinking water of poultry, calves, lambs, young goats, cattle and sheep. It is used as a preventive or therapeutic agent against Eimeria infections in poultry, especially E. tenella, E. necatrix, E. acervulina and E. praecox. It is effective against other protozoal infections like Histomoniasis (Blackhead) in turkeys and poultry; against coccidiosis in calves, sheep and goats; against amaebiasis in various species. Long-term treatment of high doses may result in delayed growth or poly-neuritis (caused by reversible thiamine deficiency). The development of natural immunity may be delayed. Do not combine with other medicines like antibiotics and feed additives. Poultry : 100 – 150 g per 100 litres of drinking water during 5 – 7 days, followed by 25 g per 100 litres of drinking water during 1 or 2 weeks. During treatment medicated drinking water should be the only source of drinking water. Calves, lambs, kids : 3 g per 20 kg bodyweight as drench during 1 – 2 days, followed by 7.5 kg per 1,000 kg of feed during 3 weeks. Cattle, sheep : 3 g per 20 kg bodyweight during 5 days (via drinking water). If no improvement is noted within 3 days, evaluate the symptoms to determine the presence of other diseases. Follow the instructions of your veterinarian or poultry pathologist.